Grow them in the garden, in containers or hanging baskets, the Snapdragon will reward you with colorful flowers through the cooler months. 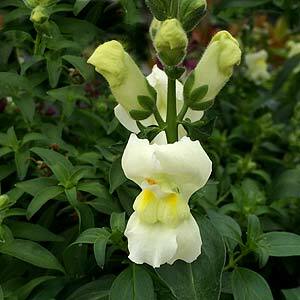 With upright, dwarf and trailing forms the Snapdragon (Antirrhinum majus) is a versatile performer in the garden. 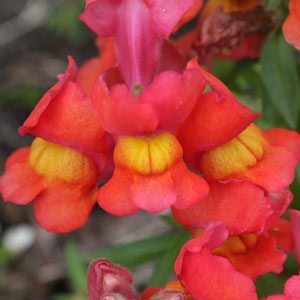 Grown from seeds or cuttings, with brilliant colourful flowers and they do flower over a long period, the Snapdragon is at home in the border, in a container and even hanging baskets, how is that for versatility. The taller varieties will reach nearly 1m and come in colours from reds and yellows, through to creams and pink. Excellent planted in large groups. Deep green foliage which lasts, topped with colourful flowers. And these varieties make good cut flowers as well. The trailing varieties can look great in a hanging basket, container or planted along a garden wall and left to hang over the edges. Dwarf types can be mixed with the trailing types to add a little height or planted in groups on their own. For something a little different look for Antirrhinum hispanicum ssp. Roseum also known as the Spanish Snapdragon, excellent as a spreading ground cover plant. Best sown into flat trays or pots in mid winter. A seed propagation mix is best, however a fine potting mix will do. Seeds need to be surface sown as they need light to germinate. Keep moist and germination will occur within 3 – 4 weeks. Use a cold frame and keep in a sunny position, or simply place the tray or pot in a plastic bag. As the seedlings become large enough to handle transplant into pots. Plant outside once they are strong enough to stand up and the danger of frosts has passed. You can also buy seedlings in punnets at most good nurseries. Best planted in a sunny position, and get them in early, try mid winter, they will flower early on and continue through spring to early summer. A humus rich moist but well drained soil is best. Water well during dry spells, and if you can provide a little shade in the hot afternoon Snapdragons will reward you with an ongoing display. A general all purpose slow release fertilizer seems to work well. Yes you can deadhead snapdragons to prolong flowering. Height – 30 cm to 1m depending on variety. Flowers – Flowers from winter through spring.